Here's a card we made at our team meeting today. I LOVE this new paper, called Wings. 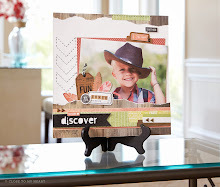 It's from the new Close To My Heart Inspirations January mini-catalog. The card was designed by team member, Roberta. She taught us how to make the scrunchy flowers from scalloped circles made from white card stock. Punch 6 scalloped circles. With a sponge, ink 3 of the circles with one color (both sides), and 3 with another (both sides). We used Black and Vineyard Berry. Then wet the circles with a spritzer (or even better, the new Close To My Heart Spray Pen*. Wait a few minutes, then scrunch each scallop up into a ball. Let dry. After the scallops are dry, unroll them a bit, take a piercing tool and poke a hole in the middle of each. Put a brad through the center of all the scallops and scrunch up around the brad to make a flower. The brad can be any kind, as long as the back is long enough to secure all the scalloped pieces. Let completely dry before adhering it to your card. This flower technique was really fun and easy! Love the card! The piercing tool is also great for placing Opaques (the little pearls) onto your projects. *Spray Pen is available in the Wings Workshop on the Go Kit (G1016, $29.95. Includes a full Wings paper pack (22 sheets of coordinating papers! ), exclusive stamp set and Spray Pen.) The Spray Pens will also be available in a 3-pack, beginning February 1. Take A Picture (C1440, $18.95 - unless you buy the Workshop on the Go during January on the same order, then this stamp set is just $15!!) - Check out the Inspirations brochure for more info.